Savvius has announced the latest version of its Spotlight network monitoring appliance. The appliance analyzes packet headers in real time and organizes relevant packet data into ongoing “conversations” that represent application use. The upshot is that network operators and administrators that run traffic through the appliance can see network and application performance in near-real time. 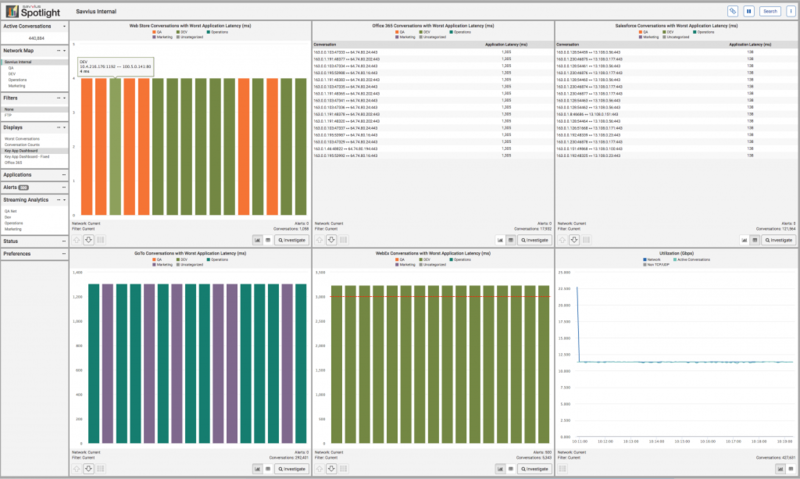 Spotlight can show network operators conversations that are suffering the worst application latency, the worst network latency, and issues such as retransmissions, jitter, connections refused, and other metrics. The company says its goal is to extract and show data within five seconds of the packet being processed. The Spotlight appliance, which comes in an 1Ru form factor, can ingest traffic at up to 35Gbps. Note that Spotlight doesn’t capture packets. If you want full packet capture plus the real-time monitoring, you’ll need the Omnipliance Ultra. This product family combines full packet capture with Spotlight’s real-time views. The Ultra targets enterprises that might want full packets available to drill into for deeper analysis or troubleshooting. The Ultra uses Savvius’s Omnipeek protcol analyzer. Storage capacity on the Ultra ranges from 16Tbytes to 128Tbytes. The Spotlight appliance and the Omnipliance Ultra appliances work with network packet brokers including Ixia, Gigamon, and Big Switch. The appliance identifies applications through a combination of port, protocol, and server ID. Savvius says it can identify SaaS applications including Salesforce, Webex, and Office365. In addition to identifying a general service such as Office365, Savvius says it can inspect HTTP headers for service identifiers to distinguish individual apps within the a general service, such as Outlook, Skype, Yammer, SharePoint, and others within Office365. As for the customizable dashboards, customers can work from a template to create dashboard views that show specific applications, network segments, geographical regions, or other views that are critical for operations to monitor. Spotlight 2.0 also doubles the number of telemetry streams from 5 to 10. Customers can select up to 10 metrics to stream off-box to an ELK database. The analytics stream provides a long-term repository that customers can use to track historical performance information and analyze trends. Spotlight will be available in the the second quarter of 2018.